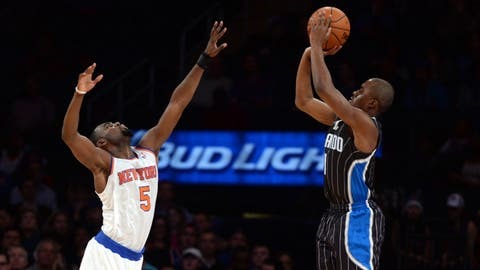 Orlando Magic shooting guard Doron Lamb (1) takes a shot over New York Knicks shooting guard Tim Hardaway Jr. during their game on Dec. 6. The New York Knicks and Orlando Magic have similar records, but the mood is quite different for both clubs. There’s a chance Raymond Felton could return Monday night for the visiting Knicks when they try to defeat the Magic for the eighth straight meeting. New York (8-18) continued its dismal season Saturday with a 95-87 home loss to Memphis. Embattled coach Mike Woodson’s bigger lineup that featured Carmelo Anthony, Tyson Chandler and Andrea Bargnani didn’t pay dividends as the Knicks were dominated on the boards. "You look at the rebounding, it was 55-29," Woodson said. "I mean that’s embarrassing, especially when you start a big lineup. Tyson, Bargnani, ‘Melo, they’re got to rebound the ball better, and we’ve got to do it as a unit better." Anthony scored 30 to reach that figure for the eighth time this season, but New York fell to 2-6 in those games as it was unable to overcome a 60-28 deficit in points in the paint. "It’s a sense of inconsistency right now," Anthony said. "We have spurts where we’re playing great basketball and then we just have spurts where we’re just dead out there. So we’ve got to get better at that." Orlando (8-19) has lost four straight at home, and has opened this six-game stretch at the Amway Center with defeats to fellow last-place clubs Utah and Sacramento. Coach Jacque Vaughn still has been happy with the leadership from veterans Glen Davis and Jameer Nelson as his club has dropped 10 of 12. "First off, that’s a direct reflection of the character of those men and what they’re all about," said Vaughn, who gave those players the day off from Sunday’s practice. "Then I think it’s an overall message that we continue to talk about, and it’s about life not being fair and it’s hard. Life is hard. Being able to deal with adversity and being able to come through it shows character." The Knicks are looking for leadership on the floor after Beno Udrih had four points and six assists against the Grizzlies. Udrih made his second straight start at point guard in place of Felton, who has missed the last six games with a strained left hamstring. Felton is listed as questionable for Monday’s game. With Felton missing and Udrih faring poorly, Woodson used J.R. Smith and Tim Hardaway Jr. at the point Saturday. "I expect those guys when they are handling the basketball to make plays and get us in our offense and we struggled in that area," Woodson said. New York should be confident Monday because it hasn’t lost to Orlando since a 102-93 defeat Jan. 16, 2012. The Knicks cruised to a 121-83 home win over the Magic on Dec. 6 as seven players scored in double figures. Arron Afflalo is averaging 24.7 points in his last three games for Orlando, which didn’t have an injured Nik Vucevic available in the first meeting. The 7-foot Vucevic is averaging 11.4 rebounds to rank fifth in the NBA. The Magic were outrebounded 45-31 without him in New York. The Magic are 0-13 when allowing 100 or more points.